Our range of products include air operated double diaphragm pump, air operated diaphragm pump, diaphragm metered dose pump, diaphragm pump, stainless steel diaphragm pump and diaphragm hand pump. 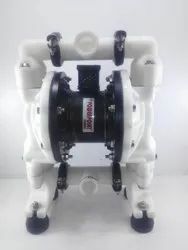 Air Operated Diaphragm Pump are mainly used in critical conditions which require entirely non motorised operations like in Petrochemical plants,Hazardous acid applications etc. Backed by a team of skilled professionals, our enterprise is able to manufacture and supply a wide range of Air Operated Diaphragm Pump. 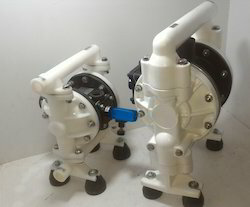 Our offered diaphragm pump is broadly used in beverage, automotive, chemical, construction and other similar industries. This pump is manufactured using the finest quality raw material and latest technology under the strict parameters. We provide this pump to our valuable clients at nominal rates. Transflo Metering Pumps are high precision positive displacement pumps, as per API 675 code. The discharge can be varied from zero to 100% capacity while pumps are running. 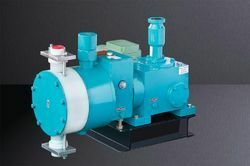 Metering Pump capacity is almost independent of the discharge pressure. Diaphragm Type Metering - Dosing Pumps. Diaphragm Pump heads are recommended for critical, abrasive, toxic or poisonous or Flammable liquids where any product leakage is not acceptable. The reciprocating plunger displaces hydraulic fluid causing movement of the diaphragm and a like movement of the process liquid. The diaphragm separates Hydraulic fluid and process liquid. A pressure limiting valves prevents overload of the pump. The internal leak age at the plunger is balanced by the leakage replenishment valve. Thus the diaphragm always operates in an optimal operating range. This diaphragm control gives very high operational safety. The diaphragm has a long life as it is always in hydraulic balance with the liquid being pumped on one side and hydraulic oil on the other side. The system is safe guarded by a built- in pressure relief valve on the hydraulic side. SS 304 / SS 316, PP & Teflon in Diaphragm Type Homogenizing etc. Accurate Dosing and Mixing of Acids, Alkalis, Slurries, Safe transfer of Viscous Liquids, Pastes, Ointments, Drum Decanting. available from 1/2" upto 2"
Available in sizes of 1/2",1",1.5",2"
Accessories : Trolley(or Fixed Mounting), +Suction & Delivery tubes +Pipes etc. in Ready-To-Use form.